The National Weather Service asserts that excessive heat was the number one weather-related killer, causing more fatalities per year than floods, lightning, tornadoes, hurricanes, winter storms and extreme cold. Evidence from the Centers for Disease Control, American Red Cross and the National Institute of Occupational Safety and Health (NIOSH) show that hot environmental temperatures cause hundreds of employees working outdoors and in hot work environments to experience heat-related illnesses and deaths annually. Heat illness can be prevented by recognizing and controlling the risk factors. Heat illness results when the body is out of heat balance. Heat balance means that the heat the body produces equals the heat it loses. When the body is out of heat balance, it produces and retains more heat than it loses causing heat illness. Heat illnesses range from heat rash and heat cramps to heat exhaustion and heat stroke. Heat stroke can result in death and requires immediate medical attention. Heat building-up inside the body from moving muscles during physical work activities is the major source of heat build- up in the body. About 75% of the stored energy the body uses to do physical work is converted into heat. Only about 25% of the energy is converted into the movements required to perform work. The more strenuous the physical activity, the more internal heat the body produces. Performing physical work activities when risk factors for heat illness are present increases the internal heat the body produces. Added to this internal heat is the external heat load on the body which comes from working where environmental risk factors (e.g., hot air, direct sunlight or lack of effective shading ) are present. A major danger from warm and hot weather, high relative humidity and lack of air movement is that these factors greatly slow the body’s natural processes of releasing heat to the surrounding environment. All of these and other risk factors can increase the risk of heat illness. Air temperature: During high heat, the air temperature and other environmental factors are more severe, which greatly increases the risk of heat-related illness. Cal/OSHA defines high heat when the air temperature is equal to or exceeds 95o F. High heat can be worse in low-lying regions like valleys and depressions, where stagnant atmospheric conditions trap the lower layer of hot air preventing air circulation. Relative humidity: High heat may also be accompanied by high humidity. When there is high humidity, sweat does not readily evaporate off of the skin. This greatly slows the body’s natural processes of releasing heat to the surrounding environment causing the body to quickly overheat. Radiant heat from the sun and other sources: The body may gain heat from radiant heat sources if the body is cool- er than the radiant heat source and may lose heat if the body is hotter than the radiant heat source(s). Thus, providing shade helps the body to cool from radiant heat sources like the sun. Conductive heat sources such as the ground: Since conduction is another way heat may be transferred to and from the body, being in contact with a hot surface such as sitting on the hot ground (or chair that has been sitting in the sun) during a rest break may limit the body’s ability to cool. Air movement: Air movement can also cause heat to be transferred to and from the body (i.e., convection). Air flowing past the body can cool the body only if the air temperature is cooler than about 95ºF. 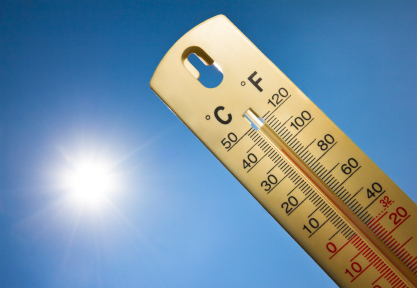 If the temperature is hotter than 95º F, the body can gain heat by hot air flowing past the body. This is why the use of fans is not an effective cooling measuring when the air temperature is hotter than about 95ºF. Workload severity and duration: Strenuous work causes the body to heat up and is a major source of heat gain for the body. Therefore, employees performing strenuous work in the heat need more frequent breaks than other employees performing less strenuous work in the heat, all else being equal. 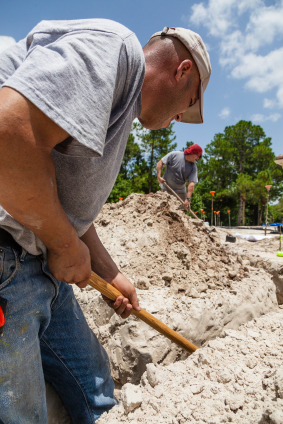 Protective clothing and personal protective equipment (PPE) worn by employees: The type and level of PPE worn are major factors which determine an employee’s additional risk of heat illness. The types of PPE employees are required to wear can vary widely. PPE worn can range from hard hats, gloves or boots all the way up to a fully encapsulating chemical protective suit and a self-contained breathing apparatus (SCBA). Wearing impermeable PPE which covers the body or face, limits air movement and the cooling effects of sweating. This results in the greatly reduced release of heat from the body to the surrounding environment and an increased heat load on the body. 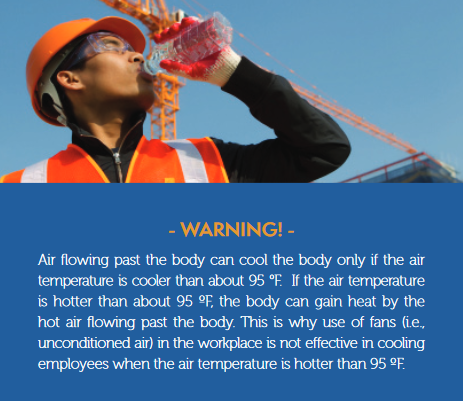 Also, wearing inappropriate work clothing (e.g., dark colored or tight fitting clothing), can increase the risk of heat illness. Water consumption: In warm or hot conditions, drinking enough water (one quart per hour during the entire work shift) to stay healthy is vital for maintaining a normal body temperature. When working in these conditions, the body looses a lot of water through sweating. Sweating helps low- er the internal body heat but as the body continues to lose water, it needs to be replaced to prevent dehydration and heat illness. Dehydration results in less perspiration so the body cannot get rid of heat fast enough causing increased heat load. The body overheats without sufficient water consumption. Degree of acclimatization: Workers new to outdoor jobs are generally most at risk for heat-related illnesses. For ex- ample, Cal/OSHA investigated 25 incidents of heat-related illness in 2005. In almost half of the cases, the worker involved was on their first day of work and in 80% of the cases, the worker involved had only been on the job for four or fewer days. That’s why it is important to gradually increase the workload or allow more frequent breaks to help new workers and those returning to a job after time away build up a tolerance for hot conditions. Make sure that workers understand the risks and are “acclimatized”. Caffeine consumption: Sodas and drinks containing caffeine and sugar may increase dehydration. Therefore, it is important to encourage employees to choose water over these types of drinks. Also, if employees choose these other drinks, they may drink less water. Medications that affect the body’s water retention or other physiological responses to heat: Certain “over- the-counter” medicines, prescription medicines, and other drugs may increase the risk for heat illness and other serious medical conditions. These substances may alter the body’s ability to deal with heat and reduce the individual’s awareness of the symptoms of heat illness. For example, cold medicine dehydrates the body. Employees should consult with their doctor if they will be working in the heat if they are taking any prescription, over-the-counter medication, or other drugs. Such medicine should be taken under the advice of a doctor. A more efficient sweating mechanism. Slightly lower carbon dioxide production. An individual’s age: Generally, maximum work capacity declines with increasing age, but this is not always the case. Active, well-conditioned seniors often have performance capabilities equal to or greater than young sedentary individuals. However, there is some evidence, indicated by lower sweat rates and higher body core temperatures, that older individuals are less effective in compensating for a given level of environmental heat and workloads. At moderate thermal loads, however, the physiological responses of “young” and “old” are similar and performance is not affected. Age should not be the sole criterion for judging whether or not an individual should be subjected to moderate heat stress. Fitness level is a more important factor. Weight: Overweight individuals produce more heat per unit of surface area than thin individuals; thus, overweight individuals should be give special consideration in heat stress situations. However, when wearing impermeable clothing, the weight of an individual is not a critical factor in determining the ability to dissipate excess heat. 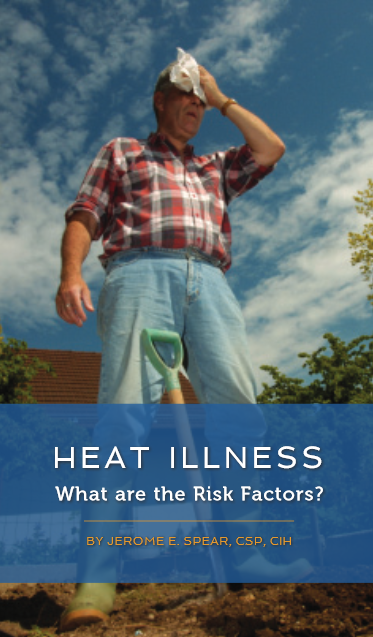 Personal risk factors may increase an individual’s susceptibility to developing heat illness. For example, not drinking enough water or drinking alcohol can both cause dehydration. Other personal risk factors which may increase the risk of heat illness include previous heat illness, excessive weight of the person, and poor levels of fitness. They can also affect an individual’s ability to acclimatize or adapt to working in hot or warm conditions. Prudhomme, J., & Neidhardt, A. (2007, October 18). Cal/OSHA Investigations of Heat-Related Illness. State of California, Department of Industrial Relations, Division of Occupational Safety and Health.